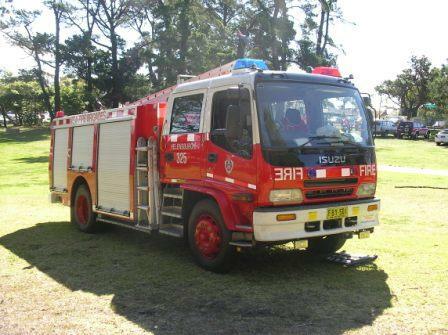 A New South Wales Fire Brigades (Sydney) type 2 Isuzu pumper fitted with a Rosenbauer NH30 pump with 2000L tank capacity and a skilled engineering body this type is replacing the International ACCO's refer photo 261. My station is getting on by the year end. Added by Mitch Getson on 05 March 2006. We are sourcing for a similar tender for our own use at Rarawai Mill. we would appreciate having your contact n details of the Tender eg costs etc.You may contact me as follows :- FSC Limited, Rarawai Mill, Ba, Fiji Islands.Email n telephone No aelaisa@fsc.com.fj (679 ) 6674044 Extension 2153. Added by Antonio Elaisa on 06 November 2006.